Two special teams’ blunders and a few passes later and the San Francisco 49ers found their outstanding 2011-2012 NFL season over. For the first time in over a decade the 49ers were once against on top of their division, the NFC West, finishing the regular season with a 13-3 record. Furthermore, the Niners dominated conference opponents going 10-2 against the NFC and 5-1 in division play. As well, the 49ers boasted one of the NFL’s fiercest defense, ranking 16th in opponent’s passing yard allowed (230.9) and an unreal best in the league in opponent’s rushing yards per game at 77.3. 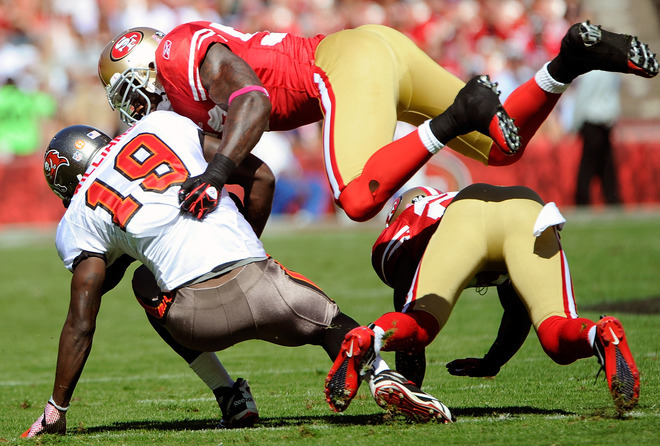 The defense was led by arguably the best middle line backer in football, Patrick Willis. Willis, now in his 5th season, is constantly among the league leaders in tackles every season and is just one of many skilled defenders for San Francisco. Joining Willis last season in the line backing core were Navorro Bowman and outstanding rookie Aldon Smith from the University of Missouri. Smith led all rookies in sacks last season at his stand up defensive end spot, tallying 14 and adding two more in the postseason. The DB’s are led by hard hitting safety Dashon Goldman and shut down corner Carlos Rogers. The concerns surrounding this upcoming season are primarily on the offensive side of the ball. The running game, led by Frank Gore (1,211 rushing yards), was 8th in the NFL last season at over 127 yards a game. However, the teams passing attack severely lacked at times finishing 29th in the league at 183.1 yards per game. Coach Jim Harbaugh and his staff have attempted to address these concerns this offseason by drafting two offensive players with their first two selections in this year’s NFL Draft. In the first round the 49ers selected Wide Receiver A.J. Jenkins from Illinois with the 30th overall pick. In the second round San Francisco drafted 2011 Heisman Finalist LaMichael James from the University of Oregon. These new additions should look to add more dimensions to the 49ers offense. As well, San Francisco picked up running back Brandon Jacobs and wide receiver Randy Moss in free agency; both of these players are proven veterans with Jacobs having just won his second Super Bowl ring with the New York Giants in February. The 49ers look to have another fantastic season with all of the new offensive additions as well as the players currently in the red and gold. Michael Crabtree and Vernon Davis are two such players, especially Davis. Vernon had career highs in yards and receptions in the 2011 regular season grabbing 67 balls for 792 yards and 6 touchdowns. However, it was during the playoffs when Davis asserted himself as one of the premiere tight ends in the NFL. In just two playoff games Davis had 292 yards and an eye-popping 4 touchdowns. One of the most successful teams in NFL history, the San Francisco 49ers seem poised at another Super Bowl run in the upcoming NFL season! 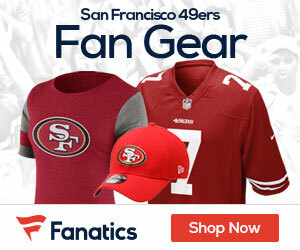 For a great selection of San Francisco 49ers tickets make sure to purchase from All Arena Seats, and enjoy the game! 1 Comment on "Niners Holding Out Hope for Big Dreams in 2012"
Vernon Davis did not have career highs in yards and receptions. 2009 he had 78 receptions for 965 yards.